ClydeNavalGazing correspondent Neil Robertson sends the following copy 18 July 2011. 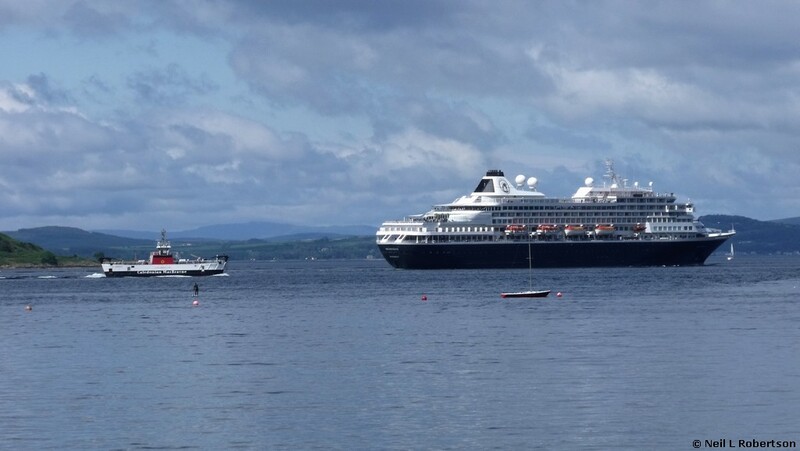 "It's not often you see a Cruise ship heading down the Largs Channel but today the Prisendam came north through the Largs Channel after coming through The Tan! 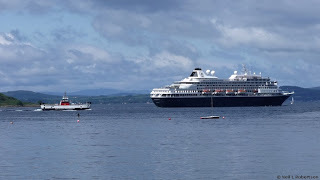 She had spent the night off Greenock and then went for a cruise up the Holy Loch and then down the west side of Great Cumbrae and into The Tan. 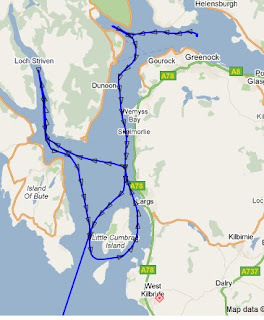 After passing Largs (photo shows Loch Brusda having gone round her stern) she headed for Rothesay and then went up Loch Striven did a U-turn and headed for Dublin. (see AIS plot) Presumably she had to leave Greenock and was killing time before she could berth in Dublin? Still it was a beautiful morning and her passengers were treated to more of our scenery then the usual cruise ship route provides."